It is rightly said that Sikkim is one of those few places in India which resemble the setting of a paradise. After all, it is the least-populous and one of the greenest states in India blessed with the charm of lakes, hills, mountains, valleys, forests and meadows. But how many of us know Sikkim as a state of historical importance? If not, then let us tell you that Sikkim has a history dating back to thousands of years. It has flourished several dynasties and powers over a period of time. Hence, it is equally popular amongst history lovers and historians. If you think you are one amongst those explorers who love scrutinising the past, then this article is certainly for you. Here, we take you through the historic aisles of Sikkim and educate you a lot about its bygone era. Whoever visits Sikkim forgets to explore the ancient ruins of Rabdentse, which is located in the West Sikkim district. Did you know that Rabdentse served as a capital of the Sikkim kingdom from the late 17th century until the early 19th century? It is located at a distance of about 130 km from Gangtok in the vicinity of Pelling. It is one place where you can enjoy the panoramic beauty of Sikkim and where you can indulge in learning about the bygone period. The ruins here include Rabdentse Palace and the Three Chortens, where the royal family used to worship their god. Today, this ancient site is under the care of the Archaeological Survey of India and is the first priority for any history lover looking forward to exploring Sikkim. Namchi is settled at an elevation of more than 4000 ft and is located in the South Sikkim district at a distance of about 80 km from Gangtok. It is generally popular for housing the world's largest statue of Padmasambhava, a Buddhist guru of the 8th century. However, it is also home to several other highly revered ancient religious sites such as Siddheswara Dham and Namchi Monastery. Due to the presence of these sacred places, it has gained fame as a pilgrimage site amongst tourists. Today, this beautiful town is visited by thousands of pilgrims and travellers from all over the country. 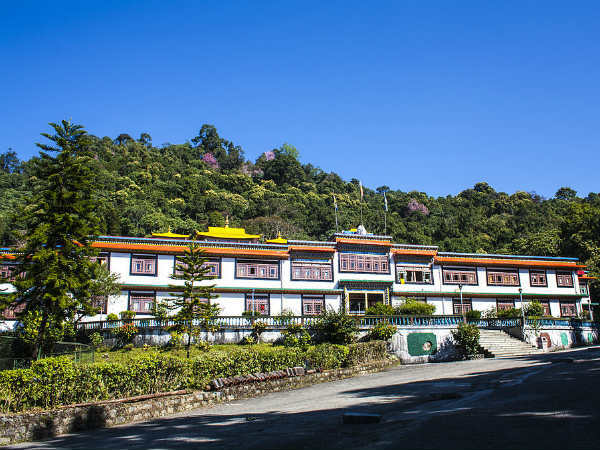 Pemayangtse Monastery is said to be one of the oldest monasteries in Northeast India and is located in the close proximity of Pelling at a distance of about 110 km from Gangtok. It is a site of great historical as well as religious importance. Therefore, it is visited by both pilgrims and history lovers. As per records, it was originally built in the 17th century; however, the current building is said to have been constructed in the early 18th century. Pemayangtse Monastery is one of the most significant places in the state and is visited by tourists from all over the state. Surrounded by beautiful hills and mountains and harbouring a serene atmosphere, this age-old site is all set to soothe your nerves. Yuksom is located in the West Sikkim district at a distance of about 125 km from Gangtok and is known as a base camp for mountaineers. But do you know that Yuksom is a historical town and boasts of several ancient sites? The most prominent amongst them is the marvellous Dubdi Monastery, which is said to be the first-ever monastery built in Sikkim by the Chogyals, the monarchs of the state. It was established in the year 1701 and since then, it has been a major landmark in the region. The presence of lush greenery around the monastery adds to its existing charm and prominence. Located in the beautiful town of Legship on the banks of the Rangeet river, Kirateshwar Mahadev Mandir is dedicated to Lord Shiva and is said to have been in existence for thousands of years. As per local legends and Hindu mythology, it is believed to be the site where Arjuna worshipped Lord Shiva to get blessed with success in the Mahabharata War. Since then, it has been a major sacred place in the region. Apart from learning about the history of the temple, you can also savour the beauty of the pristine Rangeet river. So, don't you think you must plan a visit to Kirateshwar Mahadev Mandir?